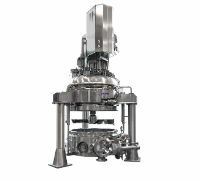 The Heinkel Drying and Separation Group supplies batch dryers for the pharmaceutical, fine chemical, chemical and food industries, where solids-liquid separation takes place thermally. You can find the animation of all these processes in the dedicated page. Please refer to the product finder via the button on the bottom left of this page for further guidance. Depending on the application, the dryers can include Ex-proof design and CIP/SIP features, several material of construction are available (from SS to Hastelloy, Titanium, etc.). See product details pages for more information.